"Seven-year-old Amanda Wilson dreams of training her own wild pony, just as her sisters have done. Then comes the chance she has been waiting for a muster of beautiful Welsh ponies that have run wild in the hills. Among them is Chessy, a striking stallion, and just the right size... read full description below. 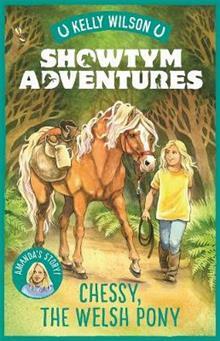 In the fourth Showtym Adventure, Amanda must earn the trust of a beautiful but wild Welsh stallion. Will Chessy ever be safe enough to ride? Seven-year-old Amanda Wilson dreams of training her own wild pony, just as her sisters have done. Then comes the chance she has been waiting for - a muster of beautiful Welsh ponies that have run wild in the hills. Among them is Chessy, a striking stallion, and just the right size for Amanda. But small doesn't equal easy, and first Amanda must prove she has what it takes by training Magic, a stroppy mare from Pony Club. Will Magic and Chessy ever be safe enough to join Amanda on her crazy adventures? Vicki and Kelly must help Amanda to win her ponies' trust in this engaging story of perseverance and reward, which is inspired by the Wilson Sisters' early years.